Over this past weekend, I returned the Nook Color I purchased from Barnes & Noble(s bks) nearly two weeks ago. I bought the device to test the latest software update which added support for email, third-party applications and other functionality. 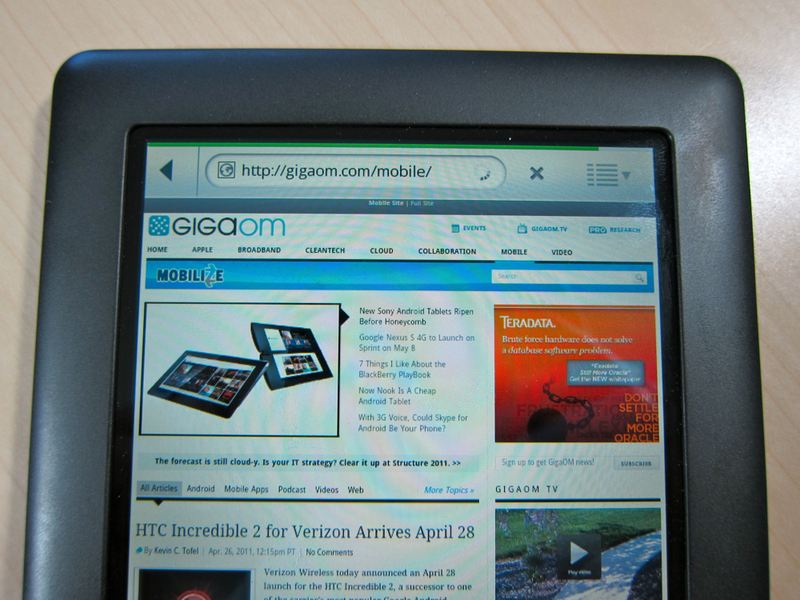 Hands-on use helped me answer the question: Is the Nook Color an e-reader, a tablet, or both? I concluded that for most people, this $249 device is an e-reader first and tablet second. And since I have a 7-inch Galaxy Tab with Android (and the Nook software application), I returned the Nook Color just inside the 14-day window. The Android community, however, offers a different perspective, thanks to efforts that turn the Nook Color into a full-time tablet that can double as an e-reader. I didn’t see this video of Android 2.3 (s goog) running on the Nook Color until after I returned the device, and I’m almost glad: Had I seen this beforehand, I might have kept the e-reader after all. Having rooted and installed custom ROMs on a few Android devices, I suspect turning the Nook Color into a Gingerbread tablet isn’t too arduous of a process, and the video shows the device works fairly well. There are some hardware issues due to most Android tablets having multiple buttons for the menu, search, home and back functions. Since the Nook Color only has a single hardware button under the display and a volume up / down switch, this presents some challenges. You can see in the video, however, that software workarounds can resolve most such issues. The Android operating system runs faster than I would have expected on the Nook Color, given that the device uses an 800 MHz processor. My Galaxy Tab is powered by a 1 GHz CPU, and the new Honeycomb tablets are all running on speedy dual-core processors. Custom operating systems, such as the CynaogenMod 7 used in the video demo, can be tweaked for improved performance. And there are applications that will overclock, or speed up, the processor as well. In the video, an overclocking app is shown boosting the processor in the Nook Color to a full 1.1 GHz speed, for example. Such software tweaks show the meager Nook Color hardware is quite capable. Adobe’s Flash (s adbe) player appears to work well, for example, and the overall animations and responsiveness of the device looks smooth. Note that the video, about a month old, used a nightly build, or work-in-progress, of the custom Android software. I’d expect the current, stable version of Gingerbread on the Nook Color to be improved, both in terms of usability and overall performance. If I had more time before having to return the Nook Color, I surely would have ventured down this custom ROM avenue. For now, I’ll stick with my Galaxy Tab, which also provides me a mobile broadband connection which can be used as a hotspot. Current Nook Color owners may want to consider taking the Gingerbread plunge by following these steps, however. While you would lose the Nook reading functionality in one regard, you would also gain it back quite easily, since the Nook software is available as a free download in the Android Market. Is it true that when the battery life is spent the unit is useless??? I imagine there will be a way to change the battery when the time comes. After all over 3 million have been sold compared to 100,000 xooms. The upcoming Toshiba looks pretty good and has a removable battery cover. I like the 7″ size the 10″ tablets are over 1/2 lb. heavier. Just FYI. If you own a Nook Color and are looking for a new sleeve case cover for it, the folks at Nuvo-Tek.com have several new colors available at a great price of $8.95 with FREE shipping. 1 things move quickly. Bluetooth works, granted with limited range, but for the purpose of gpstether, its fine. Point is, things get ironed out, and with the update feature in Rom manager, its relatively painless. Btw, video works pretty good for me, though, that is somewhat recent development. 2 access to the full extent of the Market. 3 its more portable than a laptop. I got rid of my laptop because my PC at home is used for ‘work’s and my nook for play. That said, if you need to do real work on the go, obviously a laptop. 4 distant 4, really. 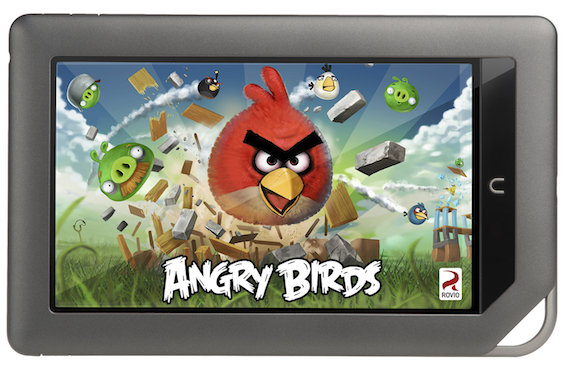 The ‘cool’ factor, everyone that plays with my nook loves it. From my 5 year old niece to the instructors at my work. As far as shortcomings, no hardware buttons is a small bummer, but you get used to it very quickly. Anyway, the implementation is elegant. Bugs, yes, theyy exist, so this isn’t for the faint of heart. That said, the nook is pretty much unbrickable, so even noobs get to play in a safe environment. I’ve had mine since end of March. Works good, running CM7 was fairly happy just rooted (Zeam and softkeys), but the CM7 or phiremod versions do bring some things like working VPN plus quite a few other features. Just depends on your needs. I’d buy a 2nd one for wife if they did the $200 sale again. I think that is the right price point for this unit. At that price they are cheap enough to give to a fairly responsible child for that matter. Rochelle, with the latest Nook version 1.2, I think they have added quite a few nice features out of the box. B&N have a good strategy going by selecting the optimal apps for their app store, keeping the kid features working (reading books, etc.) and also it seems they are not overpricing the apps (which I thought they might do). So the new 1.2 version out of box will satisfy a lot of people I would imagine. Who cares what category it is in (ereader versus tablet), it is just another toy to play with. The Nook Color is an eBook reader. It have fancy features. Sure. But it is an eBook reader primary. That is why it is optimized for reading, sold by arguably the largest retail-based bookstore in the world and allows easy access to purchase books. People really need to stop treating it like an android device and more like an eReader. Thank you, Tania! The p!ssing contest was getting old! My hope was to find an article about what someone could do with the Nook Color and the tools available for it WITHOUT hacking it. Guess I will keep looking for that article elsewhere. I took the approach of using / reviewing the Nook Color based on the official software update which adds email, apps and more. Perhaps that will help. A spell check service that app developers could hook into would be a dandy addition to Android. I run Phiremod V6.2 which is a modded version on Cyanogen Mod 7. Its a great little tablet. The form factor and performance is great. But Android to me still seems a little rough around the edges. After all this is still a phone OS shoehorned onto a tablet. Perhaps Honeycomb will be better once/if Google release the source code. So for the moment its back to my ipad. My rooted Nook Colorful is my primary computing device. I have a Dell M90 mobile workstation for heavy duty computer aided design (CAD), but that is about it. I’d probably feel differently if I had a sleek MacBook Air, but thumb typing on the NC, as I am now, is infinitley preferable to firing up the lap-incinerating Dell. I even create long form documents and complex spreadsheets. And thanks to Amazon Cloudplayer, I no longer use ITunes to manage my music collection; one less reason to fire up the laptop. But I am a technical user and a geek. Sorry, Are U Informed, but even rooted, the Nook Color is not a solution for the general public. The lack of physical Search, Menu, and Back buttons for an operating system designed to use them is a nonstarter; the software solutions (I.e., kludges) available to remedy this are marginal. And even the excellent CM7 ROM is flakey*. Never mind the actual requirement to root the system in the first place. The best Android tablet? Seriously? CM7 on the Nook Color may someday work as seamlessly as the GTab, but it will never add physical buttons or GPS. I purchased the NC for $200 on sale. Had I not and knowing what I do now, I would have gladly paid the $100 premium over the regularly $250 price for a wifi Galaxy Tab. (*In addition, random unresponsiveness at the edges of the Nook Color’s screen and other annoyances). Copied and pasted your reply into Evernote, where I thumb typed my original post and am now creating my reply. I guess I should have been more explicit. By rooting my Nook, I meant rooting and installing a custom ROM, not rooting and using the standard Nook shell, which would be an even worse contender for “best Android tablet” than CM7 on the NC. The fact that we’re quibbling about such semantics is more indication that rooting the Nook Color and installing custom ROMs is a geek pastime. I didn’t notice the unresponsivess at the edge of the screen when I used it in it as stock or stock root. But as I said, the NC is my primary computing device and I constantly have trouble selecting controls at the edge of the screen; sometimes I never succed and give up. For example, Documents to Go displays a lock icon when some feature of an Excel spreadsheet is unsupported, preventing it from being edited: touch that lock and it will tell you what’s wrong; I can’t. Selecting icons on the Dolphin HD addon toolbar is a hit-or-miss proposition. – I have a defective screen. If you want to test the specific examples I gave, I’d appreciate it and be happy to hear the results. – the unresponsiveness at the edges (again, that’s all I commented on) is a result of configuration and/or driver changes introduced by rooting and ROMing. If you read enough XDA posts, you’ll see comments about screen tweaks and such that someone has found reason to make. My money is on the second explanation – a physical design issue that does not affect operation in the carefully designed stock NC experience. I wonder if Barnes and Noble is testing for this as part of their app approval process. Finally, I’m not basing my comments on the video. Did you miss the part about the NC being my primary computing device? That said, I run the tablet nightlies of CM7 with an overclocked kernel and find the video experience is painful at best. It has to drive a lot more pixels than my EVO 4G and the hardware+latest software combination is not up to the task. By the way, where did you find a Galaxy Tab for 250? Right beside the Xoom and Ipad bundle for 20 dollars? CM7 on the Nook Color may someday work as seamlessly as the GTab, but it will never add physical buttons or GPS. I purchased the NC for $200 on sale. Had I not PURCHASED THE NC FOR $200 ON SALE and knowing what I do now, I would have gladly paid the $100 premium over the regularly $250 price OF A NOOK COLOR for a wifi Galaxy Tab (CURRENTLY $350, BUT I EXPECT PRICES WILL DROP). Dang, went back and read your comment. Your wording wasn’t imprecise. I was off. Sorry about that. So what you are basically saying, like a lot of people, you failed to research your purchase and understand what most of the tech world has been printing for 5 months, which is why they have rated the Nookcolor the best Android tablet. Further after you came to the conclusion that you’re Nookcolor lacked compared to your G.Tab, instead of doing a bit of googling to see if pro reviewers agreed with your observations you went ahead and blathered to the entire world. What a revelation on analytical skills. Nope, that’s not what I’m basically saying: that’s your interpretation of what I wrote, which I think is way off-base. My purchase was meant to simply review the device and share thoughts so that others could learn about the different alternatives and make their own purchase decisions. It was always unlikely I’d keep the Nook Color because I already have (and already knew I had) an excellent tablet in the Galaxy Tab. The only appeal after seeing the video of the Nook Color was my hobby of flashing custom ROMs and tinkering. And to be honest, I don’t need to spend $249 right now to do that as I’m already doing so on my Android handsets and my tablet. Long story short: if even one person gained some insight about the Nook Color as a tablet vs. alternatives, my time and effort was well spent. Nice comeback. No punches below the waist. I have CM7 flashed on my Nook Color. I used it to communicate on my 2 weeks on Maui. I take it with me in the morning to the coffee shop. My phone is just to small to see with these 51 year old eyes, but this 7″ form factor works quite well. Email, RSS, weather, Facebook, Google maps; this works well. And the price is right. From what I know now, I would probably go just a little bigger, like the 8.9″. Agreed, it’s nearly certain that B&N is announcing a new tablet on May 24th. Is it really? Most websites seem to think it’s an e-reader, especially since the Nook Color was released in November and B&N has yet to release an e-reader with a Pearl screen. This is pretty much all I use my NookColor for. :) Gingerbread runs great on it — you can do Honeycomb as well, but with the tablet tweaks, Gingerbread and Cynaogen seemed better to me.